Are your sash windows behaving badly? Do they rattle in the wind? Do not put up with it for another winter, Call Mortice & Green Sash window repairs now on 020 7118 9191 We have been sash window draught proofing London for over twenty years! Heat loss through windows and doors accounts for anywhere between 10% and 40% of total heat losses from all buildings. This is a very large problem that will affect your heating bills, but when you consider the cost implications of replacement sash windows it could take approximately 400 years to see a financial return of your investment. This means that improving the thermal performance of your sash windows has to be given some thought. If you feel that replacement double glazed sash windows are expensive, (which they are) but you are still aiming at reducing your carbon emissions and heating costs then what are the other options and how do they compare? It is fair to say that a draughty sash window is going to cause massive problems with home comfort and an increased heating bill. Double glazed sash windows that are not draught proofed will offer no more thermal protection and insulation than single glazed sash windows! 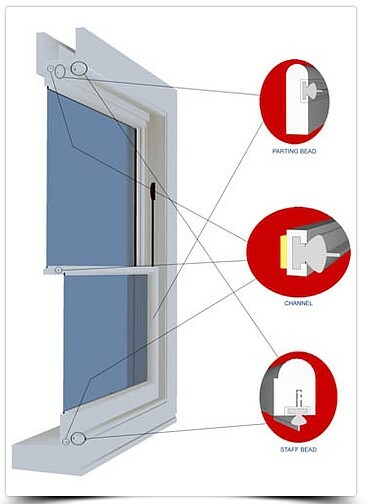 By eliminating the draughts from your sash windows even if they are single glazed you will increase the performance of your original sash windows by up to 70% and the cost of sash window draught proofing is a fraction of the cost of replacement double glazed sash windows. We offer a sash window draught proofing and overhaul service and can even retro fit replica double glazed sliding sash windows into your original box frame to further increase the insulation of your home.